If you've been following auto news, you know that 2019 is gearing up to be a great year for new car releases. Here is Spiffy's round up of 10 of our favorites to look out for in the coming year. This compact crossover first appeared in concept form during the 2016 Paris Motor Show. The market-ready model boasts most of the prototype features, making it a striking sight on and off the road. The C63 R is expected to start at about $100,000. As far back as 2017, Car and Driver called this vehicle a “car worth waiting for,” and we must say that we agree! Projected 0-60 time is 2.5 seconds, courtesy of a 1.6-liter turbo V6 mated to four electric motors. Horsepower checks in at an even 1,000, and top speed is 217 mph. 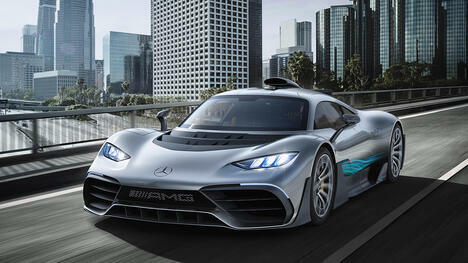 The newest Mercedes AMG, is fast and futuristic with plenty of lean muscle. Bold new design with elegant corners and modern creases make the affordable 2019 Nissan Altima a great choice for drivers who want the maximum performance for their budget. Two models will be available at launch. The Cayenne makes 340 horsepower from its turbo 3.0-liter V6, while the Cayenne S yields 440 horsepower from its 2.9-liter twin-turbo V6. Both models come with all-wheel drive and a new eight-speed Tiptronic transmission. The Cayenne starts at $66,750, and the Cayenne S starts at $83,950. This electric sedan will look a lot like the concept shown at the 2015 Frankfurt Motor Show, but EV technology has changed considerably in those two years. The Mission E is slated for debut in 2019 at a starting price of around $85,000. The Ram 1500, one of the best-selling pickups in the United States, is ready for a makeover. Look for more information, including pricing, after the Detroit Auto Show in January 2019. With a supercharged five-liter V8 engine, the Velar SVR may be the quickest range rover yet. Velar SVR’s official launch will be in late 2018. Interested buyers should start saving now, because the estimated price tag is likely going to be about $115,000. Tesla aficionados and speed demons rejoice, the Tesla Roadster has long been expected to go into production in 2019. With the ability to go from zero to 60 in 1.9 seconds and a top speed of 250 miles per hour, this is one vehicle that promises to be worth the wait. The next Audi A6 sedan will be released in late 2018, and the Avant will arrive in dealerships the following year. This is the vehicle's first major redesign in years, so look for some major updates inside and out such as a brand new touchscreen infotainment system. Want to make your old ride feel like new while you wait for the new one to hit the market? Scratch the new car itch with $20 off your first Spiffy wash or detail. Cat mom and skeeball enthusiast based in New York, NY.